Whether you are an avid skier or you are just trying the slopes out for the first time, there are some tips, tricks, and training that will help you avoid ankle injury on your vacation. If you are an avid skier that owns your own equipment, check it to make sure that it has not been damaged or broken. If you plan on renting equipment, make sure it fits snuggly and works like it should. If you are new to skiing and are unsure as to the fit of your equipment, take a lesson with a professional instructor. This will provide you with a chance to try your equipment out before taking it on the slope and possibly even give you some ski tips to take with you. 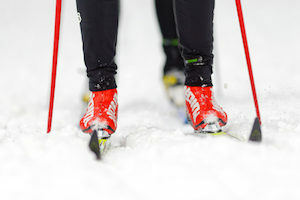 If you have a history of ankle injuries, suffer from weak ankles, or have suffered from high arches, take the time to get an orthotic device you can use while skiing. Don’t be shy about asking for help with equipment selection. The right equipment can save you pain and the expense of a doctor’s visit later. Get ready for physical activity before you go by hydrating yourself until it becomes a habit. Dehydration happens more quickly when you are in higher altitudes so you need to be ready and willing to drink plenty of water. Water also increases elasticity and flexibility which reduces injury and contributes to muscle relaxation. If you are having any issues with your ankles before the ski trip, it may be better to schedule an appointment with your doctor. Small injuries can be aggravated or worsened by the physical impact that skiing can have on the body, leading to more pain, shortened vacation times, and longer healing times. If you do need to let your ankle heal before going on your trip, your doctor will be able to advise you on the most expedient and best way to properly heal your ankle before putting more strain on it. Skiing, or any regular exercise, can put a strain on your body and cause injuries. Michigan Podiatry has several locations staffed by caring professionals that are qualified to treat the entire family. Contact Michigan Podiatry for a consultation for the family today.